Over the past week I found that the perfect cure to my Mount Mitchell hangover was rest and food. Too much food, but that’s okay. I celebrated in style by finally eating stuff I wanted. This meant I could be less picky about where to eat and what to order. In fact, I went to a restaurant over the weekend and was disappointed that the menu was too healthy. I was over chicken and and fish dishes. I have enjoyed the break, but it is time to get back to better eating. This doesn’t mean I’ll be on the same training diet as the past few months, but I will try to make smarter food choices to keep fueling workouts. The ride pauses in downtown Columbia for a moment of silence. I also spent less time on the bike, to a degree. My first ride back was the Ride of Silence, which may be a ride, but isn’t much of a workout. It was a short, quiet, three-mile coast through the heart of Columbia in order to pay tribute to fallen cyclists. This was just two days after Mitchell, so it was the perfect pace for my aching quads. Afterward we had a little social event over burritos while watching PSA adds for the Palmetto Cycling Coalition. It was a nice, relaxing evening. This weekend I was back on the bike. On Saturday I participated in the Ride for Haiti. I chose the longer, metric century option, which sounds like a lot just after Mitchell, but it was the perfect distance. There were fewer than twenty riders and the pace was relaxed. It was too relaxed for me, as it turns out, as I inadvertently pushed ahead of the pack early and missed a key turn. I ended up taking a different route to get back on the course and made up the distance elsewhere. After that I cooled my jets and rode with a pack for the majority of the ride. With just a few miles to go, I pushed harder again and sprinted toward the end at around 20 mph, just to get my heart rate up and legs stretched. It was also a good test to see how my post-Mitchell legs would respond. Despite still being a little sore, I could sense that I was pushing more power to the pedals. That is me, 3rd to the right, showing off my new Mitchell kit. 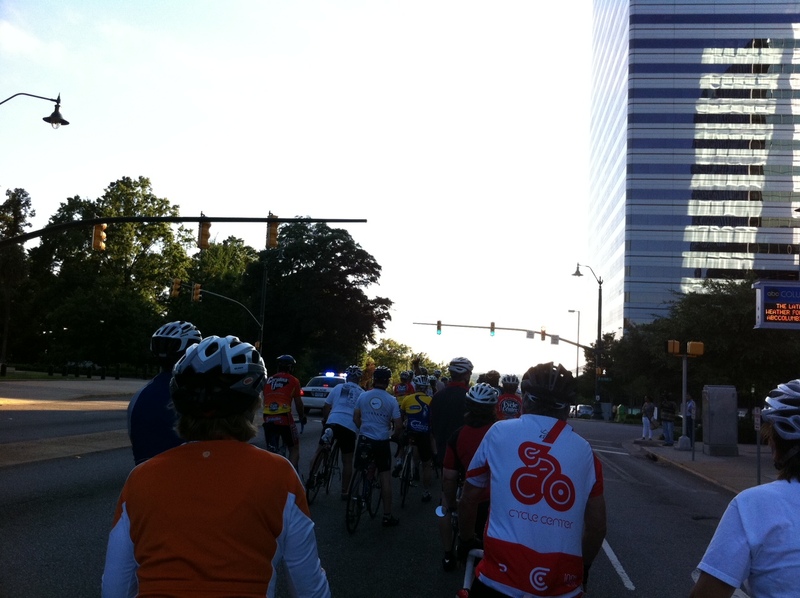 The ride was fun and well-organized. Missing the marker was my own fault. I simply wasn’t paying attention to the course. Fortunately I was familiar with the area. If someone else got lost, they may have had trouble, so I credit the SAG patrol for being on the lookout for stragglers. 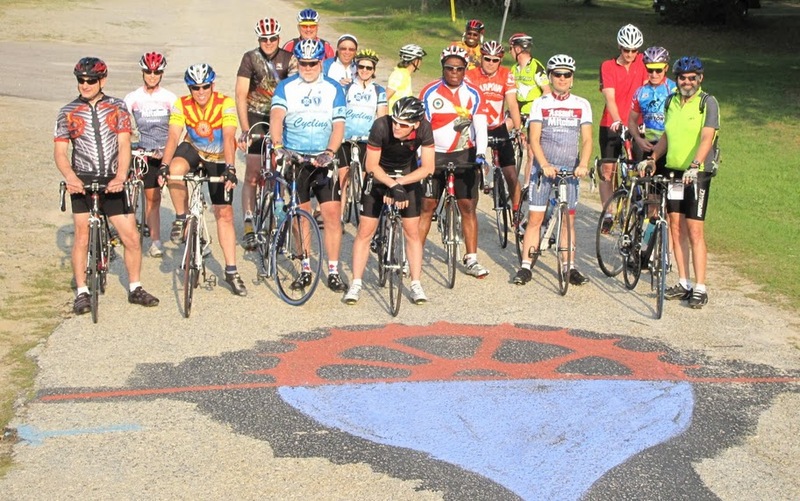 This week I am back in the saddle, taking part in all the group rides and perhaps a century (or two) over Memorial Day weekend if weather permits. This entry was posted on Monday, May 23rd, 2011 at 5:05 pm	and posted in Blog. You can follow any responses to this entry through the RSS 2.0 feed. Sounds like you are already back in the swing of things and I am glad, that you seem to have recovered well… Let me know, if there is a nice ride (100k, century) down in the Columbia on Memorial Day… I would like to try out a flatter ride for a change… Thanks. Hey Kathrin, There is not much in Columbia this weekend. I am going to check out the century rides in Hartwell, GA on Saturday and Sunday. I am guessing it will be flat there.